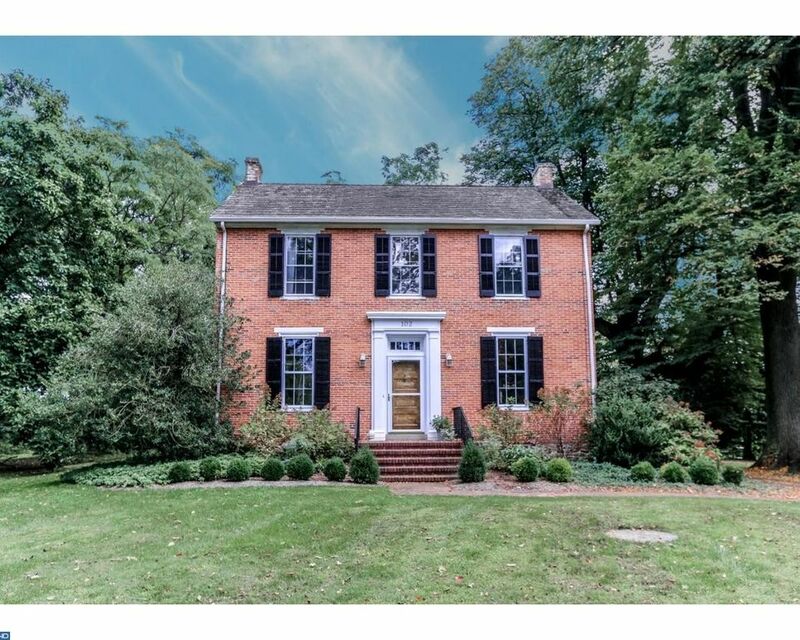 Historic home lovers... Rebel Hall is a classic Chester Country Federal style brick colonial where elegance, history, & modern convenience collide. Situated on a bucolic tree lined property this home, once owned by William Penn's daughter, Letitia, has a long history dating back to the 1790s. Rebel Hall has also been rumored to be part of the underground railroad and steeped in history of the era. The grand entrance with its gracious five panel wood door welcomes you to the traditional center hall with original wood floors and staircase. The entry hall is flanked by the living room (or possible library/music room) and a large dining room featuring the original federal style windows and glass which provide views of the surrounding property and great for seating a holiday crowd. Beyond the center hall is a beautifully and tastefully renovated farmhouse kitchen featuring soapstone counter tops, a large island, great cabinet space for storage, a two sided fireplace that opens to the warm family room and all with a large eat in area for quiet informal dinners. The first floor also offers a full bath and renovated with a fashionable brick wall and easy access to use for the pool. Off the kitchen in one direction is the large high ceiling cozy family room and the other opens to a sunroom with a black and white checked floor with plenty of room to use as an additional dining space or reading room or studio. The second floor is bright and light with an elegant master bedroom and three additional bedrooms. The bathroom is large and modern and features a full tub and stall shower. There is a walk-up attic with potential for additional living space. The basement is bright with recreation area and several subbasement areas with great potential for a wine cellar. There is a 3 car detached garage with wonderful storage, as well as a separate pool house with limitless possibilities as an art studio or woodshop. The in-ground pool completes the picture for his lovely, move-in ready home. The home is in impeccable condition and offers comfortable spaces and gracious appointments. Updated systems with central air-conditioning. Conveniently located minutes south of Kennett Square borough with its shops and restaurants and a quick ride to Wilmington & West Chester.